WHICH BRANDS HAVE SHONE BRIGHT THIS CHRISTMAS? It’s the most wonderful time of the year, and, once again, this festive season has seen businesses putting their all into decking the halls, the streets and social media with branded Christmas cheer. While the campaigns range in size, from trucks touring the length and breadth of the UK to traditional advertising on television, creativity throughout has been sparkling (is that enough of the Christmas puns?) and I wanted to share my top three festive campaigns. 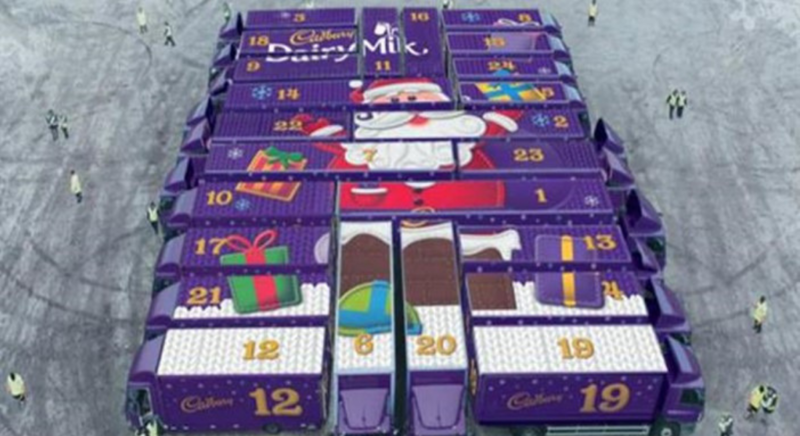 Cadbury kicked off the seasonal celebrations by constructing an advent calendar made up of 24 branded trucks – each marked with a number. Since December 1st, a truck per day has set off to a specific UK location to fill its designated destination with Christmas cheer. Just some of the advent surprises have included a white Christmas in Woolwich and a Christmas choir performance in Covent Garden featuring Walking in the Air Singer, Aled Jones. This campaign caught my eye because it’s creative, innovative and, of course, very Christmas appropriate. For me this is all about the brand demonstrating that it’s truly celebrating Christmas with consumers, making us feel warm and fuzzy. I must take my hat off to the organisers for executing this entire campaign with without an apparent hitch – it must have been a logistical nightmare! Kwik Fit’s Christmas advert is just pure loveliness. It features Santa sat in the reception room of a Kwik Fit while his sleigh – which we can see through the glass window – is being fixed by a mechanic. Santa casually sits in the waiting room reading the newspaper whilst children stare and whisper nervously to their parents. Eventually Father Christmas starts distributing presents to each child, stating their names and ages – he is magic after all! For me, this campaign shows a great deal of creativity. It has taken what is a dull brand (sorry Kwik Fit) and turned it into something rather special while remaining relevant. Three have turned Christmas on its head and put the focus not on the masses, but on the poor minority of the population who have birthdays in December. The company has been using Facebook to approach the friends and family members of those born in December to make sure they wish the individuals in question a ‘Merry Birthday’. People can also nominate friends with December birthdays to win a prize, choosing from £2,000-worth of Currys vouchers, £2,000 Flight Centre vouchers or £2,000 Love2Shop vouchers – now I wish I was born in December! I love this campaign because it sums up what Christmas is all about, making sure no one is forgotten. Those are my favourites. I hope you enjoy them as much as me. All that’s left to say is: have a wonderful Christmas, (a splendid birthday!) and a happy New Year.